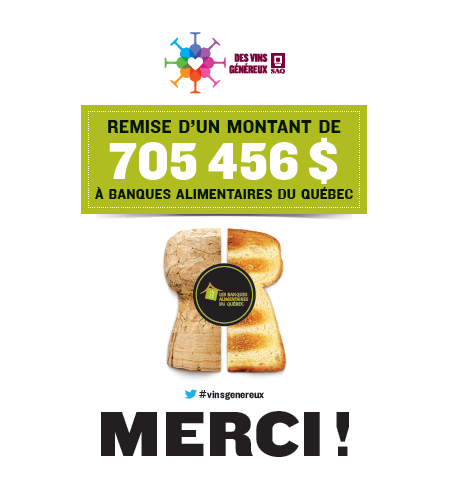 The generous wine week-end campaign of SAQ took place from 27 to 29 May 2016 in all SAQ in Quebec. During the three days of the campaign, the SAQ is committed to donating $ 1 to the organization for each bottle of white wine sold. Customers were also asked to donate $ 1 to $ 5 . Customers could also donate online through the website of SAQ.com or BAQ. Of the total amount raised during this campaign, a check for $ 18,848 was presented to Moisson Sud-Ouest. Thank you to the SAQ for his generosity! Thank you to BAQ for their support and promotional tools. And above all, thank you to all SAQ customers who have supported the cause during this week-end!